The new school building at Ashton Comprehensive School, Blackrock Road, Cork opened its doors in recent days at the start of the new school. Bishop Paul Colton, co-patron of the school, will visit the new building on Wednesday next 28th August and will speak to staff and students at the first assembly of the school year. I am really looking forward to seeing what has been achieved after a long wait for everyone associated with Ashton. A new school promised several decades ago is now a reality. I myself attended the old Cork Grammar School, so I am keen to see what has been done with that building; and when it amalgamated with Rochelle to become Ashton we watched a new school being built in the 1970s and were the first pupils to enter it. Now it has been knocked down and this new school building marks a new and exciting beginning for Ashton. 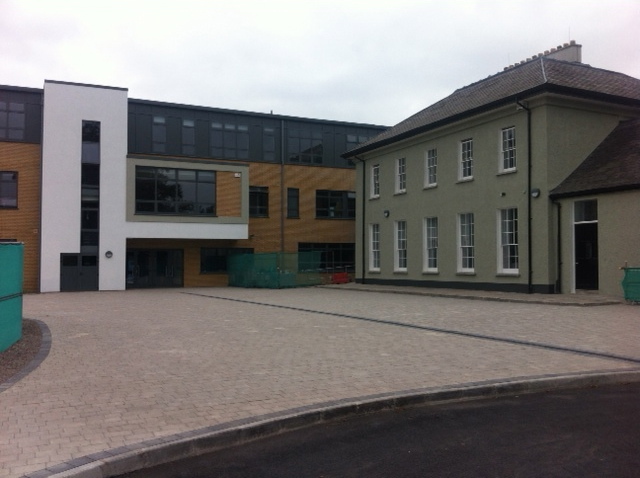 The newly opened Ashton Comprehensive School left which is linked to the former Cork Grammar School building (right). This entry was posted in Bishop, Cork, Diocese, Schools in the Diocese. Bookmark the permalink.